It’s that time of year. The Christmas tree is up and I have been rearranging the gifts under it to make it look like there are even more gifts. The fridge is stocked with Christmas Coke (you know the ones with Santa on them) and my Dad is stocking up on rum to get him through the holidays. Oh ya, and there is that little hockey tournament that will be starting up on Boxing Day. The World Junior Hockey Championship has been a huge part of my holiday traditions. From getting to watch the games with friends who are back in town from school, traveling, making babies or whatever they do; to little things like how a glass of cold pop at 10am hits the spot when the World Juniors are played overseas and all the games are shown live at a time that is way to early to be up at during the holidays. Another tradition is getting your boys together for some boot hockey after the game and trying to play with the same passion as the World Junior kids. It always ends up with someone getting hurt; either a pulled hammy or a highstick to the brow. Getting to see Pierre McGuire fall in love with new young players every year is a treat. These kids are playing to get noticed, and will do whatever it takes to win. Canada always has a decent chance of winning it all. Some years you are just amazed at the chemistry the players have with each other. It's like they have played together for years. The chance that a puck might go through the windshield of a Skoda Auto car. If the game is played in Europe, there are always hot female fans cheering and TSN cameras give them a lot of air time. This year the tournament is in Buffalo so if you like girls a little thicker and with wing sauce on their face, you'll be in luck. Watching a Canadian player lay out a Russian never gets old. Getting a chance to see future Hall of Famers dominate players their own age. Watching young guys play for their country and showing so much emotion when they win or lose. The TSN World Junior Hockey theme song is the best holiday song. 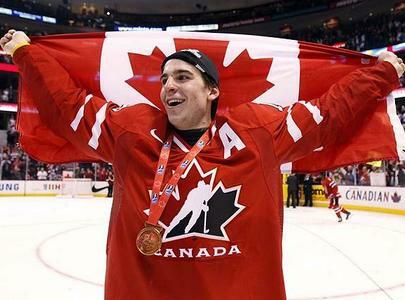 There is always a player that surprises you and becomes "your boy"
Canada vs. USA is now the best hockey rivalry. I even get nervous watching them play in a sledge hockey game. Getting together with friends and family and watching hockey. Is there anything better? Check out the Dirty Dangle World Junior Fantasy Hockey Pool. Sign up your team today. "This year the tournament is in Buffalo so if you like girls a little thicker and with wing sauce on their face, you'll be in luck."